Every December Mr. Beers and I get out some paper and a writing utensil or two and do a little thinking. We look back at the year that we've just (almost) completed, and anticipate the new year that's waiting for us right around the corner. As small business owners, we feel it's important to look back and think about the goals that we had for this year, and celebrate the things that we've been able to do, as well as look forward to the coming year and talk about the things that we hope to accomplish in the months ahead. This year we created a new logo, and used it in new to-go packaging, as well as employee uniforms and on our deli delivery van. 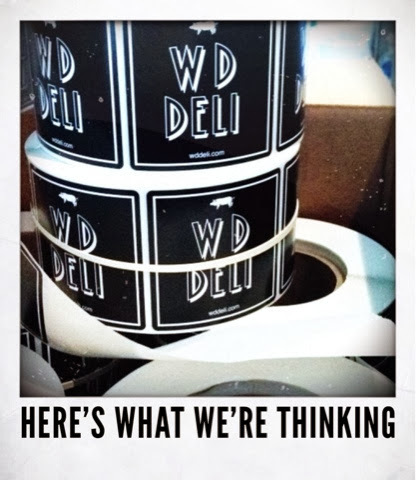 We were inspired by the trends in graphics, and yet wanted to keep the look recognizable as W. D. Deli. We hope you like it. We think the new logo looks classic and current. This year we got a new ice machine. That may seem pretty boring to you, but we're pretty jazzed about it - crushed ice!